What makes an award-winning sponsorship? It’s unlikely that winning awards was top of your priority list when you embarked on a sponsorship. Of greater importance is delivering on the promise you made to the business to provide a return. The best way of achieving this is a well-planned, well-executed and measured programme, which as it happens, is also what it takes to win awards. 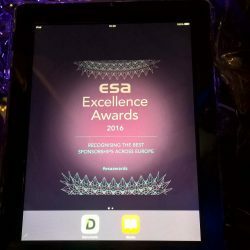 Sine Qua Non CEO, Claire Ritchie, was a category chair of judges for the annual ESA awards earlier last year, and has also been selected again for this year’s awards, so is well placed to comment on what success looks like. Identifying an aligned and relevant sponsorship opportunity is the first step. The effort that goes into selecting the right partnership is clearly important, as is the up-front planning on objectives. Setting out what you aim to achieve right at the beginning not only helps to challenge the choice of sponsorship but also ensures that everyone has bought into the programme. Together these provide the starting point and foundation for a successful partnership. Next, the focus turns to how to activate the partnership and how to measure the impact. The starting point for the activation plan should the art of the possible: a clean sheet exploration encompassing all of the audiences, channels, content, experiences, rights, activities and opportunities that can be leveraged. Real world constraints like budgets and resources typically mean that audiences segments are prioritised, but checks and balances should always return to the question of whether more value could be extracted. After all, the power of sponsorship is its multi-faceted nature and an ability to tackle the revenue/relationship/reputation challenge from multiple angles. Measurement should be the link between the overall aims and the activation, which it is why it’s so important to agree on the objectives upfront. Don’t fall into the trap of measuring things that are easy to capture. It’s tempting but they rarely deliver the true picture of the impact unless you can demonstrate a true correlation. Dig a bit deeper to understand what audience engagement means in your situation, what audience actions are meaningful or what leading and lagging indicators point to or track the impact on your revenue, relationships and reputation. Of course, it’s nice to be recognised for a successful sponsorship by your industry peers. But at the end of the day, it is really the decision makers in your business that you are trying to impress by delivering sponsorship programmes that create impact and action with your audiences.